Welcome back to the early, EARLY days of professional stock car racing! 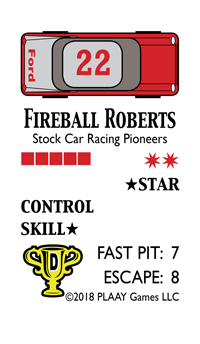 The Pioneers Stars card set for RED WHITE & BLUE RACIN' Stock Car Action game is designed to re-create on your table-top this wild and wooly, anything-goes, no-holds-barred era of stock car racing. NOW AVAILABLE! Most of the credit for this set belongs to PLAAY Gamer and NASCAR historian Jerry Minks, of Mountain City, TN. Jerry grew up around stock car racing and has a keen interest in the "good ol' days" of the sport. We spent many hours working with Jerry to fine-tune the standard RWBR game rules to accommodate the foibles and intricacies of the early days of stock car racing, with its high attrition rate due to mechanical failure and its preponderance of short, dirt track races. By the time we finished, we were enjoying a rollicking good time, kicking up dust with dramatic duels, super-star surges, rip-roaring feuds, and MORE! If you're a racing fan who's yearned to re-visit the simpler, purer, and rough-edged early days of professional stock car racing, or if you'd just like to know what all the fuss was about, here's your chance! 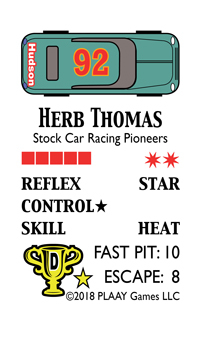 The Stock Car Racing Pioneers cards for RED WHITE & BLUE Racin' will give you a wonderfully colorful and in-depth re-creation—not just a glimpse!—of the early days of stock car racing. One of the things we did to better capture the general tenor of racing in this early era was to increase the number of DUEL results. You'll discover that on the cards representing 100 mile dirt tracks, there are now DUEL results on both black die "5" and black die "6." With the Pioneers cards, a DUEL is mandatory—a driver doesn't get the choice of whether to DUEL or not. The increase in DUEL results will, of course, lead to an increase in FEUD/FUME results, also characteristic of this era. In the early days of stock car racing, a man's car was his livelihood, and drivers didn't take kindly to other drivers who disrespected them or their equipment. You'll get many FEUD scenarios generated through Race Week, and others will generate themselves through DUEL match-ups and results. You'll experience the same sense of chagrin/delight that the real-life 1950s spectators did when the "payback" suddenly happens! On these small dirt tracks, because of the extra black die DUEL result, black die "2" results change mid-race, from MIDDLE group to TOP group. This, too, is by design, reflecting a "separation from the pack" that typically occurred in the '50s as a race entered its final stages. And there are other subtle and not-so-subtle adjustments engineered into the cards as well. As a result, the Pioneers set will give you a racing experience that "feels" distinctly different than our modern-day stock car sets. We think you'll LOVE it! A couple of the cards come with special, boutique rules to reflect a driver's unique-to-the-era driving personality. For example, Junior Johnson is given a special rating that allows him to DUEL on some results when everyone else is challenging. Herman Beam was nicknamed "The Turtle" for his unusual focus of finishing races rather than winning them (! )—he has a special card designed to capture this unorthodox driving style. We also made some modifications to the Race Week and TV Week procedures. The early days of pro stock car racing coincided with the early days of television. As such, there wasn't a lot of television coverage, especially at the smaller racing venues. Just bear in mind that when we say "TV," we’re really referring to ALL of the available media of the day: radio, newspapers and racing magazines, as well as television. We've re-worded some results and changed some others to better reflect the kinds of things that would happen in the pioneer days of the sport. For example, the Pioneers Race Week TV results allow for a "set-up" option, common in the early days of NASCAR. In those days, drivers would sometimes—ahem!—bend the rules (or, break them outright!) to gain an advantage on race day. The set-up option re-creates this aspect of Pioneers racing. When a TV result indicates a Set-Up Opportunity, the driver may accept or decline. Make your choice, then roll a die on the corresponding chart to determine the outcome and the driver's subsequent placement for the race. We also changed the "TV Interview" aspect of Race Week, with a new TV Interview chart for use with this set. Whenever Race Week calls for a TV Interview, use the charts that comes with your Pioneers cards instead of the chart that's in your Race Week booklet. The Pioneers TV Interviews are cast in a "retrospective" context. In other words, imagine that you're watching a documentary or retrospective on 1950s stock car racing, and the interview with the driver is taking place today/recently with an aging driver remembering the race you're about to run. NOTE that there are "set-up" opportunities expressed in some of the TV interviews—again, you'll decide whether the driver accepts or declines the opportunity. The Stock Car Racing Pioneers cards for RED WHITE & BLUE RACIN’ includes cards for 52 stock car pro "regulars" from the 1950s, with duplicate legendary car cards for several of them, plus another handful of "specialty" driver cards, designed for limited use. You also get a set of 32 track cards—our largest track collection ever—representing the biggest and busiest racing venues of the 1950s. And, you get the special Race Week and TV Week charts to set up your Pioneers races in classic, 1950s style! All this for just $21 postage-paid! * Order YOUR copy TODAY! * For domestic delivery; international delivery requires extra postage.